Set in the late 1980's when designer labels and charity balls were de rigeur - and mobile phones the size of housebricks, this fast moving romp sees eight guests invited to a dinner party ... but the host and hostess appear to be missing ... and then there is the blood ... not to mention the gunshots .. and the police ... plates are wildly spinning as the guests try to protect each other's reputations ... but most importantly their own! It's time for big shoulders, big hair - and tall stories! Performances nightly at 8pm, 11-14 June, plus a Saturday matinee at 2.30pm. Tickets only £7 .. bring a friend ... bring a coach party! 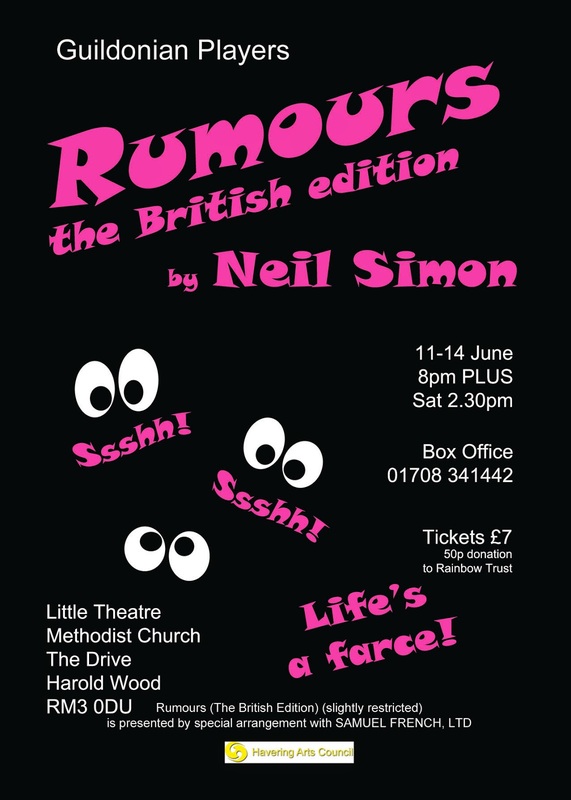 Have you heard the rumours? It's a great show!